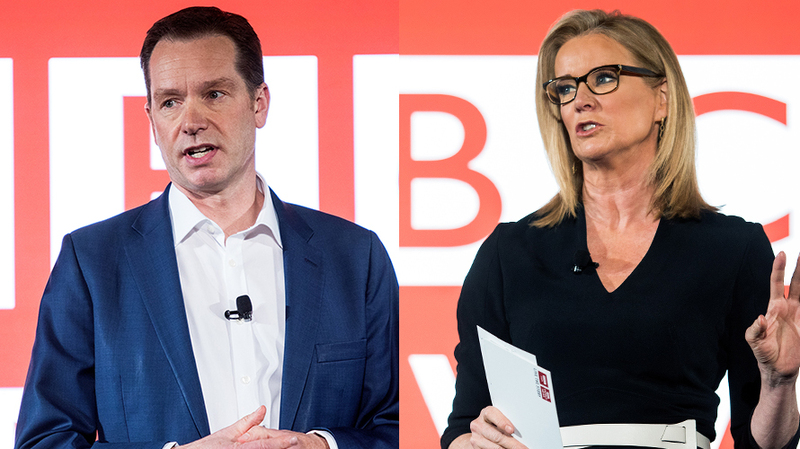 BBC Global News CEO Jim Egan and BBC World News America anchor Katty Kay speak at the NewFronts. BBC News put on its second annual Digital Content NewFront presentation this afternoon at the Dream Hotel in New York, and the company’s executives and talent hammered home the theme of “global” and “trust” to the buyers and agency partners who filled up the room. “We are trusted global news brand that has a global reach unlike that of any other broadcaster,” said BBC News’ Beyond 100 Days anchor (and frequent MSNBC Morning Joe panelist) Katty Kay, who emceed today’s event. Kay then introduced Tim Wastney, svp sales, Americas at BBC Global News, who first thanked the BBC’s agency partners and clients in the room for their support, and went on the theme of global reach. “We now reach 150 million people online every single month, and we also have access to 450 million households with BBC World News, monthly,” said Wastney. One example of this theme, Corbin explained, is a tragic one. One of the network’s Afghanistan-based reporters, Ahmad Shah, was shot dead at Afghanistan’s Khost province this morning, hours after the Kabul blast that claimed the lives of 25 people. “People like Ahmed bring stories that otherwise people would never see, and we help audiences understand the world around them,” said Corbin. BBC Global News CEO Jim Egan then took the stage, first reiterating the “trust factor” BBC News has built among its audiences, particularly among native Brits. BBC News finally hit the advertising angle 20 minutes into the 45-minute presentation, with Egan commenting that audiences and advertisers expect BBC News to be trusted commercially as well. “As a matter of policy, BBC News does not accept political advertising, nor advertising for tobacco, for adult content, for firearms or crypto currencies,” said Egan, who also spoke about an investment in Grapeshot, the conceptual advertising tool that helps brands understand which BBC News editorial they’re advertising next to. In addition to reiterating the “global” and “trustworthy” themes surrounding their traditional news programming, the company introduced new and returning digital programming. Aaron Tabas from BBC News’s content studio BBC Storyworks spoke about the new BBC Music platform, “which will speak to the trends across culture and continents, and is a platform that will hold a truly novel place in the BBC ecosystem.” Frantz touted this as a new and unique way for brands to reach music fans across the globe.